The cafeteria workers at John F. Kennedy High School served chicken patty sandwiches to students for lunch on Monday afternoon. But there was something inconspicuously different about the sandwiches, the meat between the buns was halal, allowing hundreds of Muslim students to eat lunch. The front cafeteria at Kennedy now has a section marked “halal food” for Muslim students. Alsaidi may be too liberal in his application of the Islamic dietary code. Hundreds of his fellow school mates, who practice Islam, avoid eating meat products served at the school cafeteria. 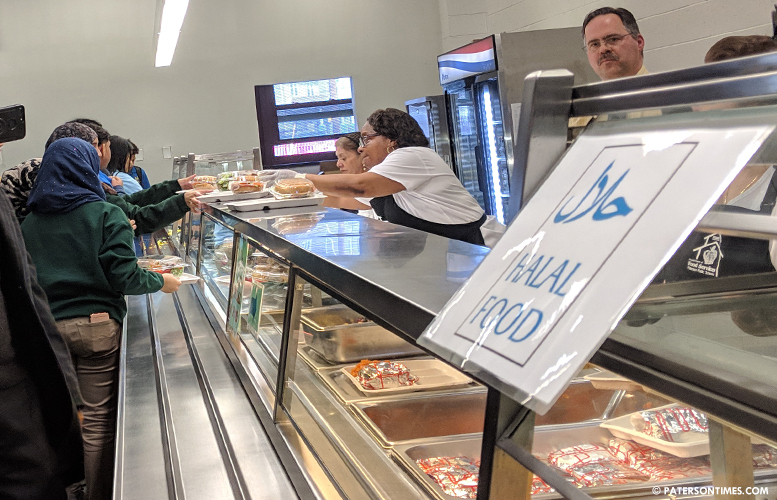 Food service staff prepared 900 halal lunches on Monday — 500 for Kennedy High School and 400 for School 5 students, said David Buchholtz, director of food services at the Paterson Public Schools. School staff had to be trained to make sure halal and non-halal items were not mixed in the kitchen, he said. Both schools have a significant number of Muslim students, predominantly of Bengali ethnicity. 30-percent at School 5 and 15-percent at John F. Kennedy High School, said Shafer. “We want them to achieve without food being a concern,” said school board president Oshin Castillo. The two pilot programs cost $40,000, according to the district. Sayegh said he would like to see the program expanded to schools in South Paterson like School 9 and Hani Awadallah School, both have a significant number of Muslims students of Arab and Turkish background. Shafer expects to expand the program in the upcoming school year, she said. The demand for halal food in schools goes back a decade. For example, some parents from School 5 had called for a halal lunch option in 2010. School officials recognized the issue of Muslim students going without lunch for an entire day by expanding the offering of fruits and vegetables over the past years. “It’s been a long time coming,” said Castillo. follow the money…see how much the halal food vendor "contributed" to oshin " I'll vote for PCT and you give me a secretary job" castillo. This area have a lot of Bengali children. I think the district should cater to them also. Please I know this is only a pilot program, but please look into how you can expand this program some of these people are not well off they also depend on school lunch. Paterson is very diverse school district. I will say this when speaking to some of these kids, 10 years old already have serious college aspirations already. Impressive pure brilliance.